By the late 1870s, half of those staying in New York hotels were permanent residents; houses were simply too expensive for most people. However, at about this time a new idea arrived from Paris that began to solve the housing problem. The first “French flats” were built on Eighteenth Street, and before long, apartment buildings were popping up all over the city, especially on the outskirts of the town above Forty-second Street. 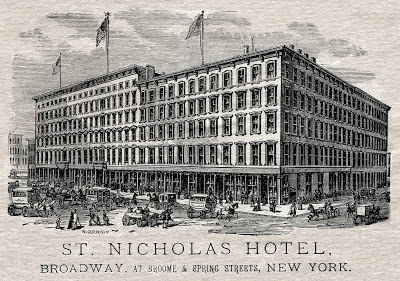 “By 1881 the hotels had lost most of their permanent residents,” recount Michael and Ariane Batterberry in On the Town in New York. “Hotels still tried to retain something of a family atmosphere, and put themselves out, particularly during the holiday season, to center the activity of the city within their walls. Christmas dinners were sumptuous, and featured menu cards ingenious and marvelous to behold.” As an example, the Christmas menu below from 1881 graced the tables at the richly-ornamented St. Nicholas Hotel whose white marble façade dominated the west side of Broadway between Broome and Spring Streets. The holiday dinner features dishes with festive names like Christmas prize beef and potatoes à la Santa Claus.